At roughly 400 memberships-strong, Redlands Conservancy thrives on the passion and participation of the people who love what we do. A membership asserts your commitment to helping us make a difference for Redlands’ quality of life. A membership also entitles you to receive member discounts to all Parties for the Necklace and the Annual Fall Social. You will also be entitled to be listed in our Annual Report if you wish, to receive email notifications of our activities, and to receive the quarterly newsletter. Show your love for the outdoors by increasing your gift to $100 a year. Heritage Club members help us keep Redlands “Redlands” with a focus on the historic buildings and structures in town. Named for one of the early packing houses, Redlands’ Best shows your love for our citrus heritage. Named for the Chicago business people whose investments fueled Redlands’ early success, this is our Major Donor group, contributing $1,000 annually. Their support makes a huge difference in what we can do. Fifty Founding Memberships were offered when this category was first launched; we still have 16 Founding Memberships available. When these are sold, new Chicago Colony members will join at $1,500 annually. For their generous support, Chicago Colony members are invited to two or three special events and activities held exclusively for Chicago Colony members each year, and receive early entry to the Annual Parties for the Necklace Kickoff Event in April. They also receive our undying gratitude, which is priceless. Learn more about the Chicago Colony. You can join the Redlands Conservancy by making any donation of $45 or more. Click here to be directed to our secure donation page. 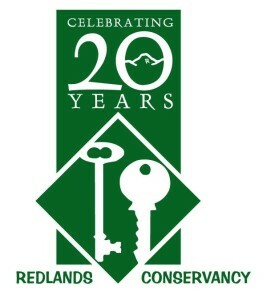 If you prefer, you may call us at (909) 782-6208 for more information, or mail a check to us at Redlands Conservancy, P.O. Box 855, Redlands, CA 92373.